A podcast of the discussion is above. 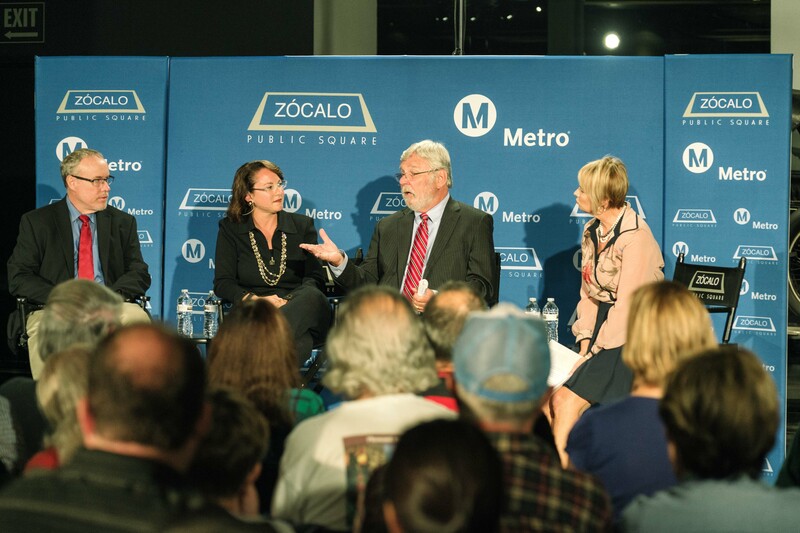 KCRW traffic reporter Kajon Cermac served as the moderator with the panel including Metro CEO Art Leahy, UCLA Director of Transportation Studies’ Brian Taylor and Hilary Norton, executive director of Fixing Angelenos Stuck in Traffic. Thank you for sharing. Traffic congestion, particularly in Los Angeles, is very complicated due to various levels of stakeholders’ interactions. This includes various and “challenging” funding sources, countless jurisdictions, numerous planning documents, and differences between local and regional priorities and preferences [one missing element is affordable housing]. A shared vision for the region would likely frame transportation initiatives, projects, and programs under “sustainable development”, balancing the three “E’s” (social equity, economic, and environment). This vision would add a range of complementing and integrated strategies for addressing traffic safety, mobility, and location accessibility. For peak-hour congestion, please lookup a 1992 book titled “Stuck in Traffic: Coping with Peak-Hour Traffic Congestion” by Anthony Downs. This book presents a range of strategies that remain relevant today. Integrated corridor management (ICM) strategy had been recently developed to improve and optimize traffic operations by linking multiple jurisdictions and optimizing available transportation network capacity. It includes information technology tools to provide automated and predetermined response to sever traffic delays, incidents, or special events. It is based on regional traffic modeling predictions but specifically modified for jurisdictional preferences (i.e., avoid schools drop off periods or corridors with roadway maintenance or construction activities). In addition, implementing complete streets policies (and complete intersections) will enhance livability , addressing safety and convenience for pedestrians and bicyclists, while providing for goods movement and emergency services needs. Traffic congestion is a complicated subject, one that reflects life and place desirability. Summary: Taylor and Norton talked about how much progress LA has made with cost-effective solutions like the Rapid Bus network and ExpressLanes. Leahy talked about how much he likes taking the choo-choo to ‘SC. I enjoyed the event. The moderator seemed to be bringing up lots of personal anecdotes and asking the panel members to account for them, which they couldn’t. But, I learned a lot. The dialogue about the express lanes was particularly interesting, with the UCLA professor citing that 48% of traffic during peak hours was being moved in the pay lanes despite them appearing “empty” to drivers in the free lanes. Is financing a potential “R2” through means other than a sales tax a complete non-starter? Given the panelists’ opinion that mitigating traffic is really an issue of reducing the need to make long choice trips by car, is there anything that Metro can do to encourage the land surrounding the rail stops to be used correctly? 1. I don’t think it’s a non-starter. The project may prove capable of securing a public-private partnership to supply the funds to build it. That said, certainly sales taxes produce direct revenue and that does make life easier. I think we’ll know more in the next eight or nine months as Metro works on producing a final list of projects to be funded if, in fact, the agency decides to pursue a ballot measure in 2016. 2. Metro does own some parcels directly adjacent to a few transit stations and does have some control over what gets built there. However, it’s really the cities in L.A. County (or the county on unincorporated land) that decide the zoning codes that determines what gets built where. Ultimately, the decision to increase density or not comes down to local officials who must weight the pros and cons. I think we’re seeing that play out in Santa Monica, where there have been some notable controversies over how much or how little to densify, particularly in the area within a mile of the Bergamot Station stop for Expo Line phase 2. In plain English: if you want more density (or less), bend the ear of your local council person! From 2005 through 2013, the Census Bureau American Community Survey (ACS) results show driving to work by car, van and truck fell by 2.5 percentage points. Walking, bicycling and transit have all gained a larger commuting share. From 2007 through 2013, driving to work by car, van and truck increased by 22,000 more people and bicycling increased by 11,000 more people. Commuting by transit has decreased. Most of the increase in the rate of commuting by bicycle can be attributed to a sharp rise in the price of gas between 2007 and 2008, along with close to 200 miles of bike lanes and paths installed in three fiscal years. To increase the amount of people moved along arterial streets parking should be prohibited. Doing this would create enough space to put protected bike lanes on most arterial streets in Los Angeles. From what I gather, its uncommon for there to be motor vehicle on arterial streets in the Netherlands. Professor Ashworth, of the department of planning for the University of Groningen, explains at 3:05 in this streetsfilm that businesses were against having parking removed in front of their stores in the late 1970’s in that city. He states that they complained that they would have to immediately move and go out of business as a results. It turns out that they stayed and that people adjusted to the changes. I meant to say that its uncommon for there to be motor vehicle parking on arterial streets in the Netherlands. Like the doctors creed, “first, do no harm,” If you want to speed up traffic, the first thing is not to make it worse with road diets- especially on streets that already have left turn lanes, and toll lanes that slow down everyone but the well-off who can afford to pay. Hey, everyone, the solution may be as simple as throwing ALL of our energy into the construction of a pervasive and extensive rail system, instead of applying band-aid-like quick fixes to the present automotive transportatiion system which, as we have already discovered, simply just do NOT work!